Outside my window... rain, rain, rain. It's a lovely warm rain, though, and got me out of putting the towels on the line and watering so I'm a fan. I am thinking... it feels later than it is. I am thankful for... my camera. It was a surprise gift a couple of years ago; I'm still enamored with it. From the kitchen... stir-fry with homemade General Tso sauce that I could drink by itself, I love it so. Our dinners are lunch-food and lunches dinner-food, so at dinner-time (lunch, right?) we had samichs. I am creating... I just finished a knitted cotton tank for my lil tot, but it turned out too wonky at the arm holes. LE SIGH. Tonight I will rip and fix it. Last week the sewing machine was tackled and I managed some jammie pants for her with this super duper, easy p pattern. I am going... nowhere! The kids will be down in a few hours and I'll be going to Netflix with my man and Coconut Bliss ice cream. Oh yes. I am reading... Allllmost done with 2666, which got very page-turny in the second half. It seems like a book Smock would really dig. We're about to start The Tale of Despereaux with the boys. I've never read it, it'll be fun to have it be a first for all. I am hoping... that I can fix the tank with minimal pain. I am hearing... the little one with keys. Has there ever been a toddler that didn't adore a ring of keys? Methinks no. Around the house... we set a picnic table up in the backyard yesterday. Costco had huge, heavy, metal-bottom ones with lifetime guarantees that were not resistible. Jeff is off this week and changed out the light fixture in the hall today and scraped off and replaced the caulking-whathaveyou around the potty. I've been doing laundry and went to the post office. Exciting. One of my favorite things... is that MamaT likes watching the breakaway kids at church. We're sitting with her from now on. A few plans for the rest of the week: I promised I'd walk to the park tomorrow with Jake so that he can try out his new skateboard. Wednesday we're leaving for a little road trip down to Bastrop State Park. It's in the Piney Woods, about 30 minutes east of Austin. We're renting a little cabin there that I used to visit as a kid. Cannot wait. The children are way more relaxed about the whole thing than I. Words I'm pondering: 1 Corinthians 13:1-13 is tacked to my desk because I need to marinate my mind in it daily: Love is patient, love is kind. It does not envy, it does not boast, it is not proud. It is not rude it is not self-seeking, it is not easily angered, it keeps no record of wrongs. Love does not delight in evil but rejoices with the truth. It always protects, always trusts, always hopes, always perseveres. Love never fails. Here is a picture thought I am sharing... 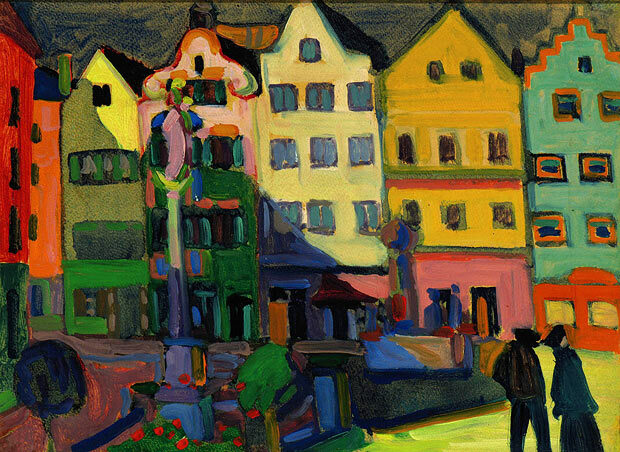 This is a Kandinsky that I saved to post for Fine Art Friday. I didn't get a chance then, so here's a bit of fine art and color on rainy Monday. I wish you WOULD sit with me! This page contains a single entry by LaMamacita published on May 17, 2010 3:59 PM. MamaT's Monday Daybook was the previous entry in this blog. smock's monday music is the next entry in this blog.